It’s either down to the sheer star-power of IBF heavyweight champ Anthony Joshua, or it’s down to the Dec 10 card in Manchester being a pretty stacked one, but 15,000 tickets have already been sold for the card that will be topped by Joshua’s second title defence against dangerously determined challenger Eric Molina. Can Molina, 25-3(19) test Joshua the way he tested Wilder last summer? Can Molina hit and hurt Joshua the way he hit and hurt Wilder in the early going of their battle? It is largely the credible and gutsy showing Molina gave against Wilder that got him this, a second world title opportunity, and Molina says he will make the most of it, as improved a fighter as he is today. With the likelihood of a sold-out Manchester Arena on fight night, the atmosphere will be something special. 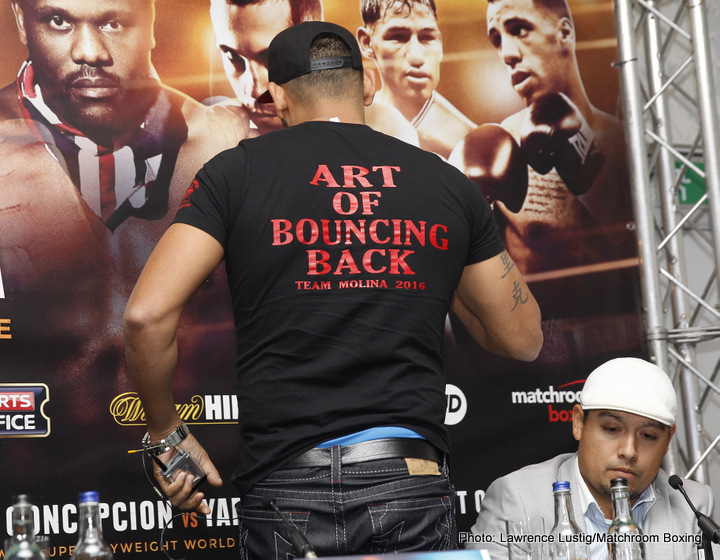 Will AJ send his fans home happy, or will “Drummer Boy” Molina silence the huge crowd by causing a stunning upset? With that huge fight with Wladimir Klitschko set for Joshua next spring, Molina would be wrecking plenty of big plans if he scored the upset.